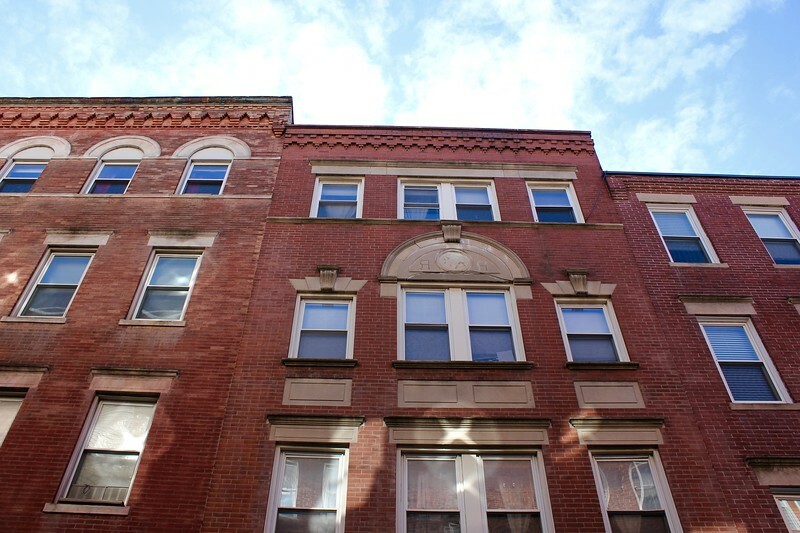 If you’re heading to Boston, check out this North End Boston History Tour by Context Travel! After living in Boston for nearly nine years, I thought I knew the city pretty well. 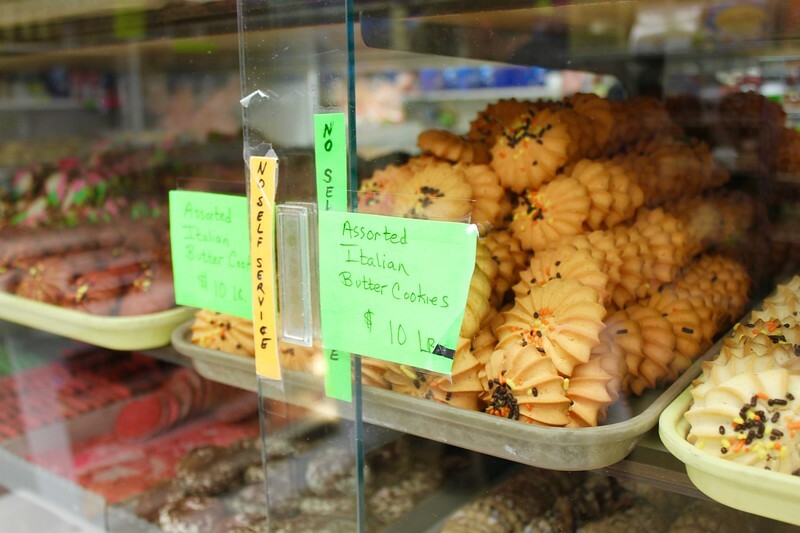 I also thought I knew a fair amount about the North End, Boston’s “Little Italy,” since I once organized my own walking tour of the neighborhood and have taken numerous out-of-town visitors there to decide for themselves which bakery makes the best cannoli in town – Mike’s Pastry or Modern Pastry. 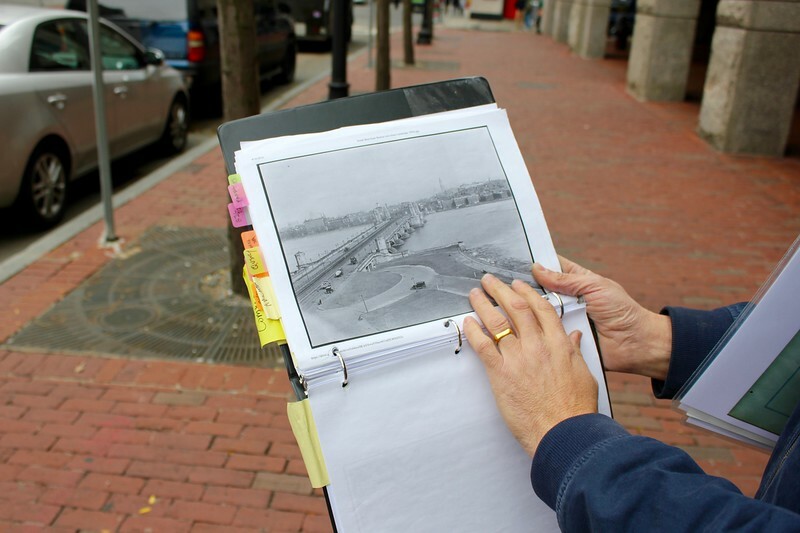 Then one damp and gray Saturday morning, I took Context Travel’s North End Boston History Tour, “Portrait of a City.” The docent, Leo, a history buff who works for Cambridge Public Schools, made my jaw drop on more than one occasion during my nearly four-hour experience. His tales of money, murder and mayhem went far beyond the standard walking tour script of facts and anecdotes, and had me captivated from beginning to end. 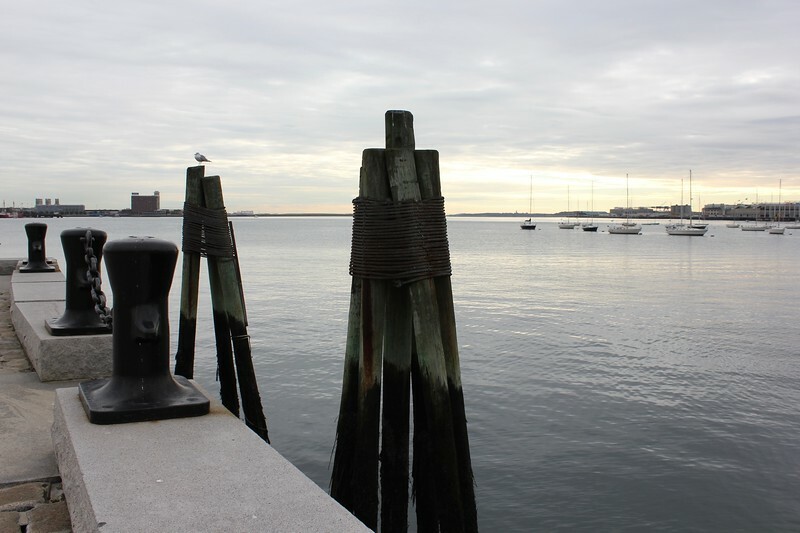 After meeting on the Greenway, Leo and I walked to the end of Long Wharf, where I tried to concentrate on what he was saying despite the bitter wind whipping off Boston Harbor. There he set the stage for the rest of the tour, detailing Boston’s evolution from being a prime spot during pre-colonial days for the Messatsoosec tribe to come to fish in the summer to becoming the “greatest harbor in the Americas” during the 1700s. Long Wharf extended nearly a half-mile into Boston Harbor and back to State Street until the Harbor was filled in to extend the shoreline. Today this dock is used by various sightseeing cruises and tour boats. To escape the wind, we walked away from the water up State Street, which once was the center of Boston’s financial power for the city’s elite, the Brahmins. We stopped across the street from the Custom House (now home to Marriott Vacation Club Pulse), where I learned the Puritans – Boston’s early settlers – referred to Boston as “the city on the hill” (influenced by future governor John Winthrop’s declaration, “We shall be as a city upon a hill, the eyes of all people are upon us”). Leo had a binder packed with maps and other reference materials that he referenced throughout our walk. Leo told some of the juiciest stories when we stopped in front of Faneuil Hall Marketplace. Today Faneuil Hall is one of Boston’s most popular tourist attractions, but early farmers were not a fan of it. They set it on fire multiple times, worried that having to compete to sell their goods would drive down their prices. Leo described early settlers of Boston as starving, anxious and always “ready to fight.” There were riots against impressment – Boston’s men were vulnerable to being kidnapped and forced to work on British warships – in 1747 as well as against the Stamp Act of 1765. Colonialists also fought for entertainment. I was surprised to learn that Guy Fawkes Day, which commemorates the failed plot by Catholic activists to blow up British Parliament (and Protestant King James I) in 1605, was once one of Boston’s most popular holidays. Gangs from the North and South Ends would each parade their effigies through the streets and then meet at Faneuil Hall for an all-out brawl. The winner then burned everything in a celebratory bonfire. 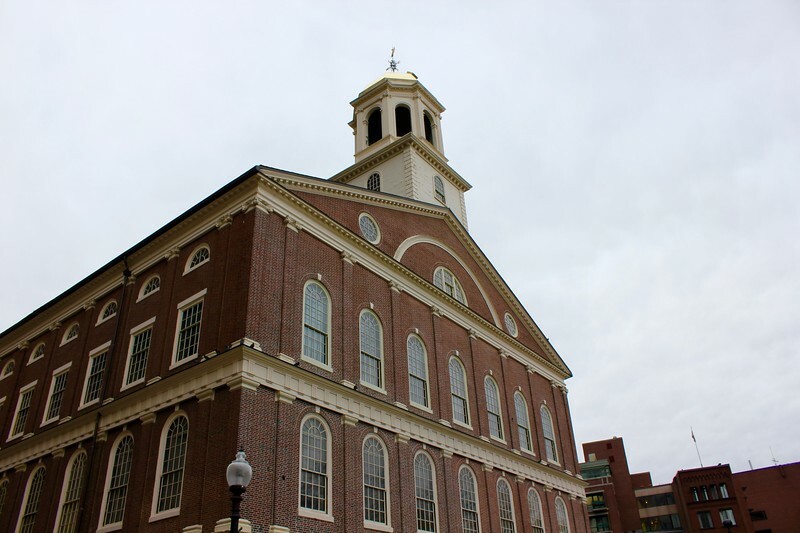 Built in 1747, Faneuil Hall is now home to dozens of shops, pushcarts, restaurants, and bars, and offers entertainment in the way of street performers, musicians, outdoor movies, and more. 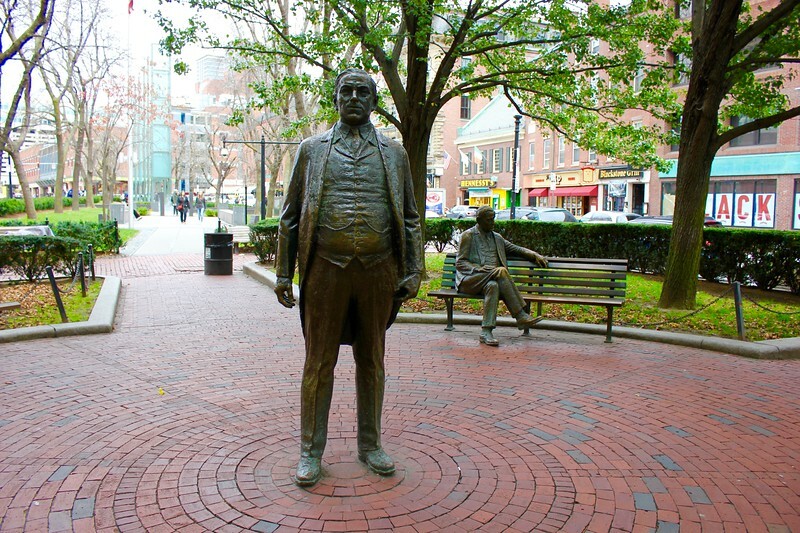 Across the street from Faneuil Hall in a small park are two statues of James Michael Curley. When the Irishman was elected Mayor of Boston in 1913 he declared, “The day of the Puritan has passed.” He served four terms as mayor and one term as governor of Massachusetts. I’ve passed by these statues dozens of times and never stopped to take a closer look. Leo took pity on my frozen hands, so our first stop in the North End was a bakery. Over tea and cookies, he filled me on the neighborhood’s early history. 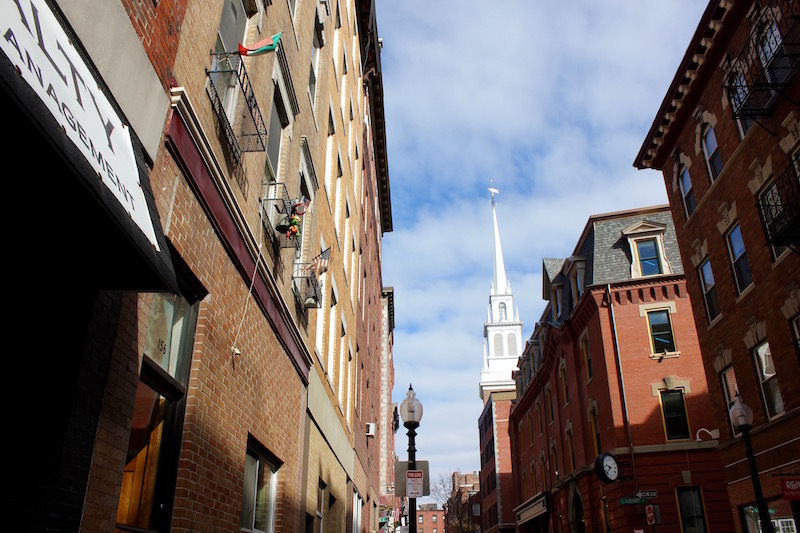 Most people only know the North End as being dominated by Italians, but it was actually the Irish who settled there starting in the 1820s, after wealthier residents moved to Beacon Hill. The number of Irish then dramatically increased during the Great Famine of the 1840s. The Italians and Jews arrived toward the end of the 20th century, and by 1920, 90 percent of the North End was Italian – by then Jewish residents had moved out to the South and West Ends. We also talked about more recent history, including discriminatory lending practices within the city that spurred the Jewish migration to suburbs, and massive highway protests that took place throughout Boston in the 1960s and 1970s – North End residents had been cut off from the rest of the city when the Central Artery was built in the 1950s, leading to the neighborhood’s temporary decline. These Italian butter cookies are just like the ones my family makes. Leo and I then strolled down Hanover Street, the North End’s main thoroughfare, pointing out our favorite restaurants to each other. One stop we made was at St. Stephen’s Church, since I had previously never been inside. Particularly memorable was what Leo told me after we passed a sign commemorating the site of the former Sacco and Vanzetti Defense Committee’s office – during the early 1900s the North End served as the unofficial headquarters of the Italian anarchy movement. Pro-worker and anti-capitalist, the anarchists carried out a series of bombings all over the country. 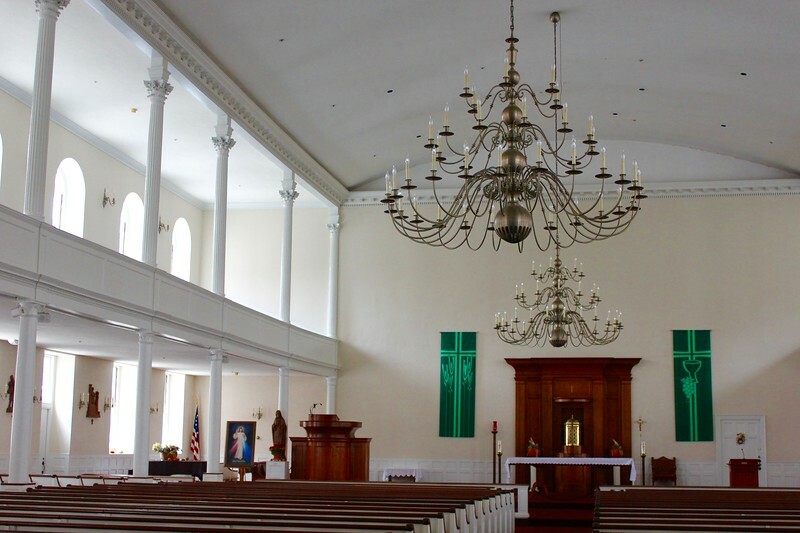 Rose Kennedy was baptized at St. Stephen’s Church. Her funeral mass was also held there in 1995. 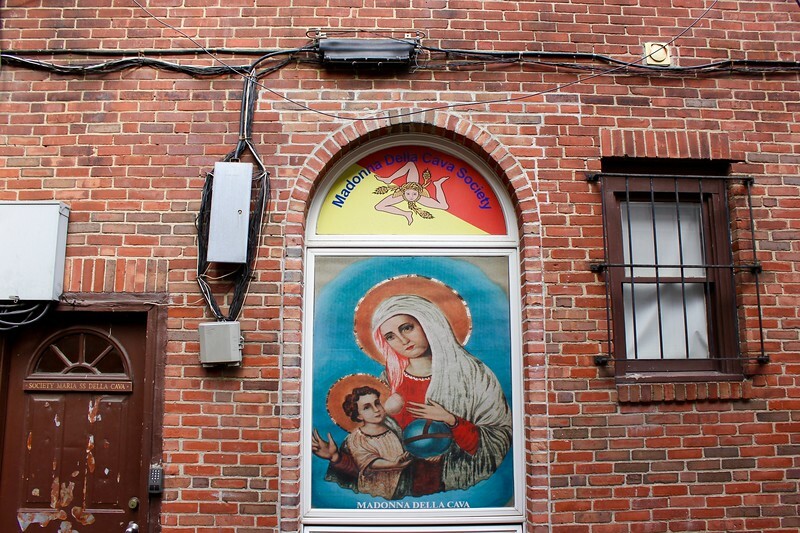 The Madonna Della Cava Society hosts the Madonna Della Cava Festival each August to commemorate a boy’s discovery of an image of the Virgin Mary painted on a stone. It coincides with the festival that has been held for centuries in Pietraperzia, Sicily. 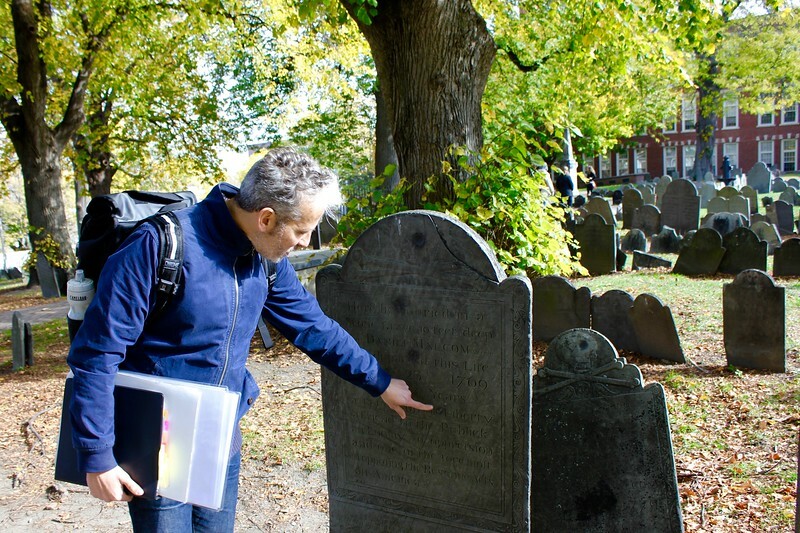 We then went up to Copp’s Hill Burying Ground, the second burying ground established in Boston, where Leo pointed out the tombstones of notable Bostonians. He also showed me bullet holes on Daniel Malcolm’s tombstone, which I had never noticed before. Apparently, British soldiers, who were stationed at Copp’s Hill during the Revolutionary War, entertained themselves by using the tombstones for target practice. Leo shows me the bullet holes on Malcolm’s tombstone. The North End’s Jewish community was concentrated along Salem Street. What sets Context Travel tours apart from other walking tours? Context Travel tours are highly personalized. The guides try to tailor the information they deliver to each person’s interests, background and even political views. Context Travel docents are scholars and specialists – in disciplines including archaeology, art history, cuisine, urban planning, history, environmental science, and classics – who hold graduate degrees and have deep subject-area expertise. 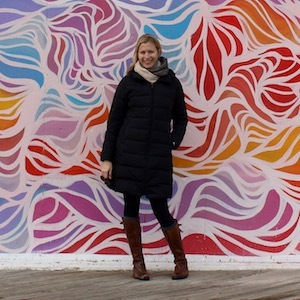 Want to check out a Context Travel tour for yourself? 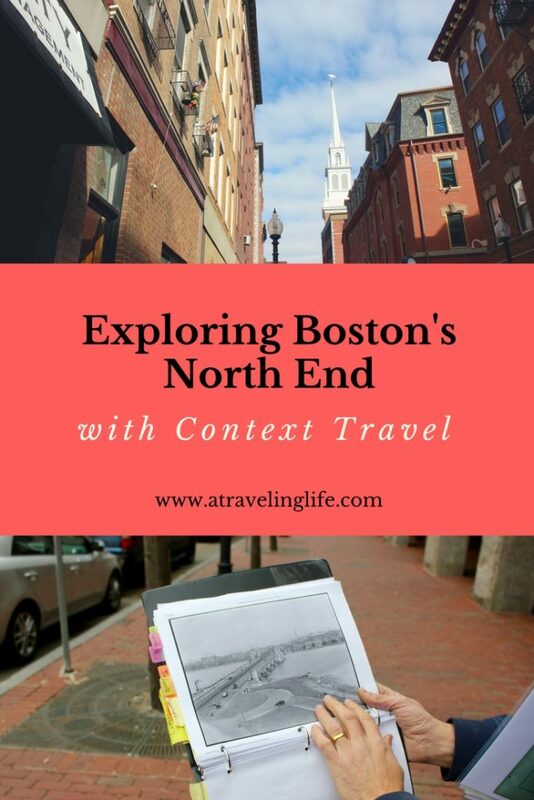 Context Travel operates these Boston tours, as well as others in nearly 40 cities around the world. Thank you to Context Travel for providing me with this complimentary tour. As always, my opinions are my own. I still haven’t been to Boston. I love history walking tours and that bakery looks so yummy. Boston is an amazing city (although, I admit, I’m biased because I live here). It’s packed with history, and there are lots of great places to eat too. If you ever come visit, let me know!